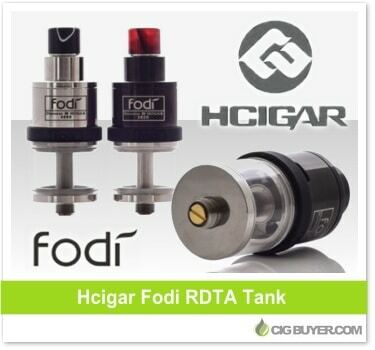 The HCigar Fodi RDTA Tank is one great looking rebuildable dripping tank! Although it only has 2.5ml of capacity, if you’re looking for the performance of a dripper and the convenience of a tank, this 22mm platform has a two post build deck (with ceramic insulator) for single and dual coil builds. A dedicated fill hole allows for easy refilling, and a clean separation between the tank and the atomizer creates purer and more consistent flavor. Constructed from quality 316 stainless steel and glass, it includes bottom adjustable airflow, gold-plated 510, acrylic drip tip and comes with various colored silicone bands.